Bartram Trail is perhaps one of the sweetest pine-carpeted, mountain biking single track adventures in Georgia, offering six and a half miles of "Gateway," beginning at West Dam day use area through to Petersburg Campground, while the more advanced portion from Petersburg to Wildwood Park offers nine miles of fast single track challenges and a brisk ride through Wildwood will allow one to reach nearly eight miles of more technical obstacles of Keg Creek. Location: On U.S. Army Corps of Engineers, J. Strom Thurmond Dam & Lake Project, Clarks Hill, SC - Georgia side of project. From Augusta, GA. take Highway 104/Washington Road North. Turn East on US 221 and continue to Petersburg Campground, Lake Springs or West Dam day use areas. Additional access areas are located along Highway 104/Washington Road North at Wildwood Park and Keg Creek WMA. The Bartram Trail was named for William Bartram. He was America's first native-born naturalist/artist and the first author in the modern genre of writers who portrayed nature through personal experience as well as scientific observation. His travels from Augusta, beginning in May 1775, took him north to Fort James on the Petersburg Road, paralleling the Savannah River about three or four miles away from its banks. On this journey he passed through Columbia and Lincoln Counties in areas now covered, at least in part, by J. Strom Thurmond Lake. The Bartram Trail is approximately 27 miles long from West Dam day use area to the Keg Creek portion of the trail and is well identified with yellow blazes. Caution should be taken because the trail crosses several roads as it meanders through the woods. The Lake Springs Loop Trail, a looping spur trail with white blazes, splits off near Lake Springs day use area, and it provides an additional 2.8 miles of trail. Within the Lake Springs day use area an additional 1.3 miles of paved trails allow visitors to explore the shoreline. This trail meanders out to an observation tower that provides panoramic views of the nearly 73,000 acre J. Strom Thurmond Lake, which is the largest Corps of Engineers project constructed east of the Mississippi River. One can experience the wonders the shores of Thurmond Lake can provide, just as William Bartram most certainly did while exploring the Savannah River and Georgia forests. The outdoorsman may take time out to explore the continually changing landscape. Loblolly and shortleaf pine may be seen at the higher elevations. A pine-hardwood forest becomes prominent where once pure pine stands were harvested. Many types of hardwoods are visible, including red gum, yellow poplar, black gum and various species of oak and hickory. A number of game and nongame wildlife species may be observed by the alert hiker/biker-naturalist. The forest provides a home for white tailed deer, turkey, quail, rabbits and squirrels. Song birds are also abundant, though their song is heard more easily than they are seen. Thurmond Lake and associated creeks provide excellent habitat for beaver. While hiking/biking near the shoreline be alert for telltale signs of the beaver and his home, or perhaps glimpse the Bald Eagle soaring above. The natural beauty of the area along the shore is still intact and will be apparent to any hiker/biker who explores the trail between Lake Springs Road and Petersburg Campground. This section is a gateway that offers opportunities for young riders and new cyclists to the sport a great beginning experience, which crosses an abandoned airstrip currently being used as a wildlife food plot. In other areas the trail may pass near private land where one can observe the multi-million dollar commerce of the local timber industry. Vehicle parking lots are located at four points along the Bartram Trail: West Dam park entrance, Petersburg Campground entrance, and approximately 3 tenths of a mile on the left after you turn on Lake Springs Road which all have primitive restrooms on location. The fourth parking lot is located at Keg Creek Wildlife Management Area. The Bartram Trail is primarily a hiking and biking trail however other health and fitness benefits can be enjoyed such as running or walking. Some use it in preparation for longer hikes, such as the Appalachian Trail and the Bartram Trail in Northern Georgia and North Carolina each of which is approximately two and a half hours drive away, while others may take a day outdoors with the family. Trail maintenance is provided by volunteer organizations such as the Boy Scouts of America and a partnership agreement with Southern Off-Road Bicycle Association (SORBA). Recent additions to the trail are nine miles of moderate to advanced single track that allow the connection of Wildwood Park to Petersburg Campground. This connection has taken into consideration the International Mountain Bicycling Association's (IMBA) best design practices. Camping is also available in designated areas only, both in Wildwood Park and at Petersburg Campground. Many youth organizations such as the Boy Scouts of America use these camping areas as overnight stops while hiking the weekend, or while working on service projects. Other volunteers may stay at these campsites while performing trail maintenance with Corps of Engineers. 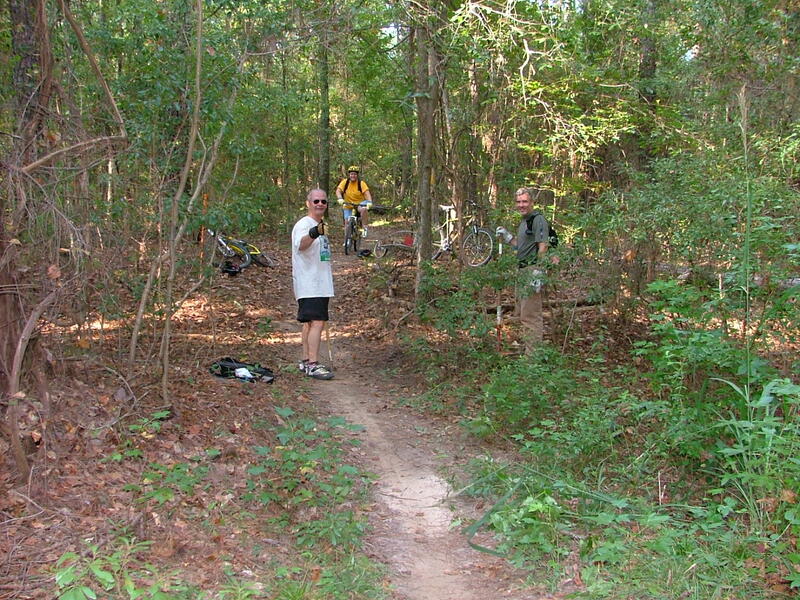 Several events are held annually along the Bartram Trail such as SORBA's Annual Bike Fest, Take a Kid Mountain Biking and the Best Dam Bike Ride. The Augusta area hosted IMBA's International Mountain Biking Conference in 2010, and the U.S. National Cycling Time Trials were also held in June 2011 at J. Strom Thurmond Lake. In addition to the annual events, Thurmond Lake will host a triathlon at West Dam Park in 2012. Resting at lakes edge against tree. SORBA-CSRA member Jim Culpepper taking in a lake view. SORBA-CSRA members during National Public Lands Day.